Jerene Jarvis Johnston and her husband Duke are exemplars of Charlotte, North Carolina’s high society, where old Southern money—and older Southern secrets—meet the new wealth of bankers, boom-era speculators, and carpetbagging social climbers. Steely and implacable, Jerene presides over her family’s legacy of paintings at the Mint Museum; Duke, the one-time college golden boy and descendant of a Confederate general, whose promising political career was mysteriously short-circuited, has settled into a comfortable semi-senescence as a Civil War re-enactor. Jerene’s brother Gaston is an infamously dissolute bestselling historical novelist who has never managed to begin his long-dreamed-of literary masterpiece, while their sister Dillard is a prisoner of unfortunate life decisions that have made her a near-recluse. As the four Johnston children wander perpetually toward scandal and mishap. Annie, the smart but matrimonially reckless real estate maven; Bo, a minister at war with his congregation; Joshua, prone to a series of gay misadventures, and Jerilyn, damaged but dutiful to her expected role as debutante and eventual society bride. Jerene must prove tireless in preserving the family's legacy, Duke’s fragile honor, and what's left of the dwindling family fortune. She will stop at nothing to keep what she has—but is it too much to ask for one ounce of cooperation from her heedless family? 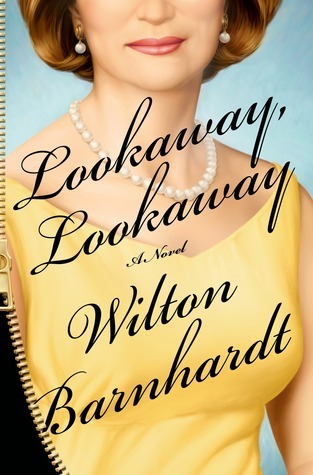 Wilton Barnhardt (born 1960) is a former reporter for Sports Illustrated and is the author of Emma Who Saved My Life (1989), Gospel (1993), Show World (1999), and Lookaway, Lookaway (2013). Barnhardt took his B.A. at Michigan State University, and was a graduate student at Brasenose College, University of Oxford, where he read for an M.Phil. in English. He currently teaches fiction-writing to undergraduate and graduate students at the North Carolina State University in Raleigh, in the Master of Fine Arts program in Creative Writing. Since attending Book Expo America, I have been overwhelmed by the choices I have for my next book. I picked Lookaway, Lookaway because it seemed different than my usual choice of YA books and I wanted to mix it up. Each chapter is from the point of view of a different member in an upper-class, North Carolina family. Because of the switching, the book was a little hard for me to get into. Just as I started understanding and getting to know a character, it would be on to the next one. The characters had a lot of problems. The family was basically falling apart and losing its status as a pillar family in their town, but they tried really hard to sweep their problems under the rug and keep them out of the public eye. I had a really hard time liking any of the character because for the most part, they weren’t good people. The author did a good job of making them authentically privileged and entitled. I wanted to feel bad for them for their trauma, but it was hard because I also hated them all to a certain extent. I’m glad I read the book because I think it’s really important to get out of your comfort zone in reading every once in a while. I may not have enjoyed reading Grapes of Wrath, but it expanded my reading horizons and that is how I feel about this book as well. I, personally, wasn’t Lookaway, Lookaway’s biggest fan, but I think the author is a great writer and others might consider this a fantastic read. Think Lookaway, Lookaway might be your cup of tea? Check it out for FREE! Enter now to win an ARC* of your very own! I loved reading your "My Take" on this book. I'm about 2/3 of the way finished and am enjoying it for the most part. I agree that the characters are not very likeable. If anyone is interested in a online book discussion of this, GoodReads "Southern Lit Lovers" is reading this as their September selection.